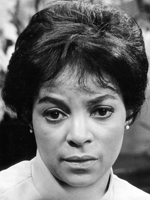 Ruby Dee has many acting and writing credits. She is best known for her role in 1961's A Raisin in the Sun. 01/13/1974 0008 Cold Storage A man finds out that his believed to be dead mother is still living and unleashes a Machiavellian plan to acquire her wealth and property - by shutting her away in the basement. Here Goes The Bride was the best one she did! She sounded so sophisticated, rich, elegant, and regal. She did a great job. Actress Ruby Dee recently died at age 89 of "natural causes" according to her daughter. From 1974 to 1975, she appeared in four episodes of CBSRMT. The episodes range from Southern gothic romance to supernatural adventure. Hats off to a major talent.